Kevin Cortright is a bankruptcy attorney with offices in Murrieta and Palm Springs. Handling cases involving personal bankruptcy filings for Chapter 7 and Chapter 13 throughout San Bernardino and Riverside Counties. Call today to talk to Kevin immediately. Lewis & Ham truly listen to your needs and thoroughly analyze your case to determine if bankruptcy offers the most effective way to ease your financial burden. We review your debts, income and expenses, and clearly explain the impact of bankruptcy. Duane Booth has a 20 year history of 100% success for clients that file a Chapter 7 bankruptcy: every client that has filed has received a bankruptcy discharge of debt! If you are worried about whether you will qualify let's talk. InlandEmpireLawyers.com is the most comprehensive directory of validated local listings for bankruptcy attorneys in San Bernardino and Riverside. Our profiles have nearly every piece of information you'd want to research regarding local BK lawyers including links to ratings and reviews from credible websites. At the Law Office of Timothy Combs, our experience and knowledge in the area of Bankruptcy law make us the ideal advocates to represent your best interests. You won't save money by filing with the “help” of paralegals. Bankruptcy is much faster and cheaper to do it right the first time. Bankruptcy Law is 1 of the 11 eligible areas of specialty in the state of California. Not every family law attorney is a "certified bankruptcy law specialist" nor are they required to be. Attorneys who are "certified specialists" will be indicated with the logo, (below), directly on their profile. 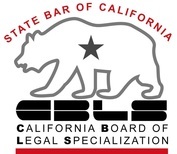 What does it take to become a California certified Bankruptcy Law specialist? Click HERE.